As I promised in my previous entry, the recipe which I have for you today comes from For the Love of Food book by Denis Cotter. I've tried three recipes form the book so far: Vanilla & Coconut Risotto with Spiced Mango and Pistachio (for breakfast), Fingerling Potato, Watercress & Walnut Salad (my lunch), and Baked Pumpkin, Leek & Coconut Curry with Green Bean Salsa (dinner). All the dishes came out delicious, very aromatic and flavorful. My favorite one, however, is the breakfast risotto and that's the recipe I'd like to recommend you today. It might seem weird for some of you to have rice for breakfast (not so much for me-rice cooked with milk used to be a common breakfast meal in Poland where I come from), thus the author suggests thinking about it more as rice porridge than a classic risotto. And indeed, the final result came out creamy and porridgey. The procedure here is exactly the same as in classic risotto recipes. First, you toast the rice with a little bit of fat, then add a little bit of wine, and then gradually add the liquids (in case of this risotto, the liquids are milk and coconut milk). Separately, you prepare spiced mango sauce. As most of the recipes in this book, this one takes lots of time to prepare, so I'd recommend it for a weekend breakfast. I prepared most of the ingredients the night before, so preparing the rice in the morning took me about 40 minutes. It was definitely worth it though. The rice came out creamy with a strong vanilla flavor and a subtle note of coconut and citrus fruit. 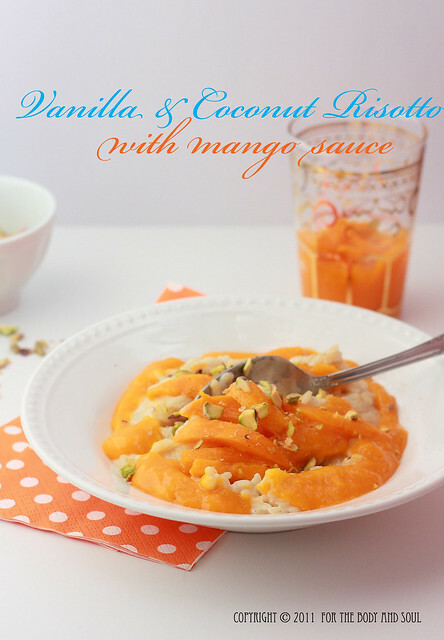 Together with the aromatic and flavorful mango sauce, pistachios and a pinch of nutmeg it was absolutely stunning. Have a good evening everyone!!! To make the mango sauce: put the sugar, star anise, cloves, and ginger in a small saucepan. Add water and bring to the boil. Remove from the heat. Leave in the saucepan to cool and infuse. Pass the syrup through a fine sieve. Peel the mango and slice the flesh. Blend half of the fruit together with 2 tbsp. of the spice syrup to a purée. If the syrup seems too thick, add a little water to get a pouring consistency. If not sweet enough, add a little more syrup. Slice the remaining mango into matchsticks.Place in a bowl with 1 tbsp of the spice syrup. To make the risotto: put the milk, coconut milk and sugar in a saucepan and bring to the boil. Reduce the heat to a simmer. Split the vanilla pod lengthways and scrape the pulp. Stir into the milk mixture. Heat the butter in a wide, heavy pan over medium heat. Add the rice and toast for 5 minutes, stirring constantly. Add the white wine and simmer until it has been absorbed. Add a ladle or 2 of the hot milk mixture. Let simmer until the milk has been absorbed, stirring frequently. Add another ladle of the milk mixture. Simmer for about 20 minutes, stirring often and adding the milk mixture in stages. When the rice is tender and has a nice creamy consistency, remove from the heat and stir in the citrus zest. Serve the risotto in shallow bowls. Pour over a little mango sauce . 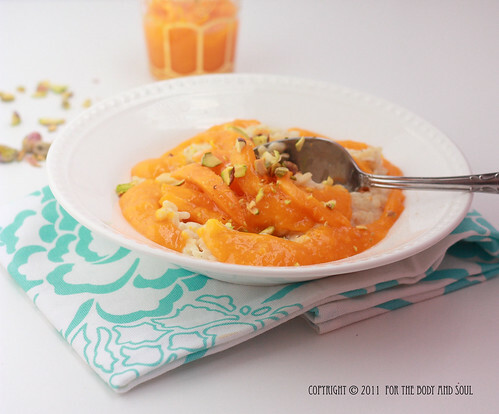 Place some of the sliced mango on top, scatter over the pistachios and grated nutmeg.